Simply stated, transparency is the act of disclosing, bringing to the open what seems to have been done in secret places. Accountability is the act of taking responsibility for actions committed. The argument is that once transparency brings secret acts to the known, accountability will follow. There seems to be a positive relationship between transparency and accountability, at least according to Transparency International and the World Bank. Many scholars, such as Paolo De Renzio at the Overseas Development Institute and Sarah Mulley at the Global Economic Governance Programme, disagreed with this assessment. Others argue that there may be a more sinister movement taking place when exposing actors that seem to be outside of public reach. What do they mean? The following real life scenarios illustrate this debate. The case of Eric Garner shows a cop choking a man to death. So far, right or wrong, there has been no satisfactory legal repercussions for the police officer. Although, the facts surrounding this case seem to have been well documented. Transparency was not an issue as many seem to believe they knew all the facts in this event. But apparently accountability did not follow transparency. One did not cause the other to happen automatically. What was missing? There are those who believe that accountability has been very much in display when the Grand Jury decided not to indict the officer responsible for the death of Mr. Garner. Mr. Daniel Pantaleo, the policeman in question, submitted himself to the jurisdiction of the justice system, fulfilling his role of accountability. It was up to the justice system to render a verdict. The justice system was represented by a prosecutor and 24 unknown actors who decided the validity of this case. Except for the prosecutor, we may never know who these citizens were. We may also never know what they discussed and how they came up with their final decision. But we know this; the final verdict did not meet the test of trust for millions of citizens. The line between transparency and accountability in this case is blurred, at best. The case of Michael Brown in Ferguson, Missouri also surrounded a white police officer shooting a black man. According to media reports, the evidence presented to the Grand Jury was sketchy at best. A federal investigation is still ongoing. The fact is that a man was killed and days of violent protestations around the nation followed suit because accountability was apparently absent in this debate. Some argue that justice was served. They argued that the days of protestations around the nation following the verdict, were conducted by biased civil rights leaders who would have been satisfied with only a guilty verdict. Once again, the lesson learned is that the so called transparency in this case did not meet the threshold of accountability acceptable by all. Can we talk about subjectivity when referring to accountability? In the next case, the United States revealed that the Central Intelligence Agency (CIA) tortures detainees. This case is well documented in a congressional report. The CIA itself did not totally disavow the findings. While one can argue that transparency was certainly an ingredient in the decision to publish this report, accountability so far has failed to show up. Why? Does it take time for accountability practices to catch up with transparency measures? One of the strongest arguments that arose from the 2008 economic recession is that, although many of the players that caused the downturn are fairly known, the top individuals who led these reckless acts have not been held responsible for their actions. Expert reporting established clear links between actions of these players and consequences on the global economy, but individual accountability is still missing in action. Are these players too big to be accountable? This is the current dilemma between transparency and accountability. One does not necessarily trigger the other. There is even a scarier thought that transparency exposes to the public what is hidden behind the veil of corruption and deception, showing how influential some actors are, and exposing the weaknesses of current systems to bring these too powerful actors to accountability. In this sense, transparency is used to intimidate people against participating in change events and bringing about the opposite effect of accountability. 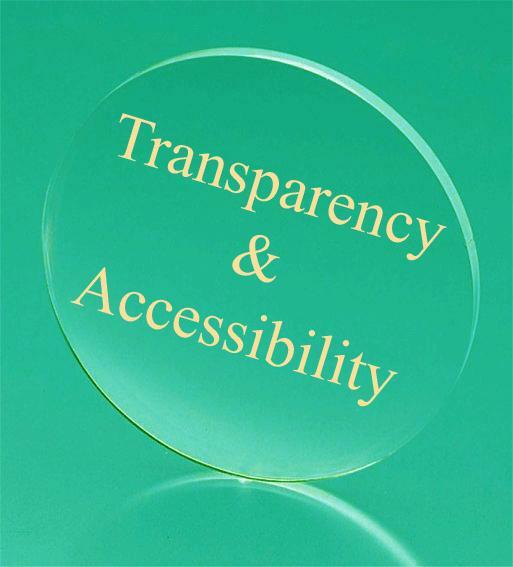 We should find the missing link between transparency and accountability. This will revolutionize our socio-interactions as a nation.